A new conveyor system for metal detectors has been designed to improve reliability, decrease maintenance and reduce the total cost of ownership for processors of dairy, snacks, meat, poultry, seafood, bakery and prepared foods. The Thermo Scientific Quickfit conveyor was engineered to integrate seamlessly with the Thermo Scientific APEX metal detectors. 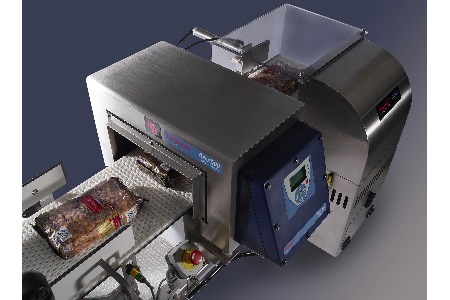 Each Quickfit unit is tested to eliminate problems food processors can experience when relying on third-party material handling, fabrication and integration with high-performance metal detectors. The modular design uses common components to reduce total ownership costs over the typical 10-plus year metal detector conveyor lifetime. This helps customers better utilize their capital and maintenance budgets. For more about Thermo Scientific product inspection equipment, visit www.thermoscientific.com/productinspection. Thermo Fisher Scientific Inc. is the world leader in serving science, with revenues of $17B and approximately 50,000 employees in 50 countries. Our mission is to enable our customers to make the world healthier, cleaner and safer. We help our customers accelerate life sciences research, solve complex analytical challenges, improve patient diagnostics and increase laboratory productivity. Through our premier brands – Thermo Scientific, Applied Biosystems, Invitrogen, Fisher Scientific and Unity Lab Services – we offer an unmatched combination of innovative technologies, purchasing convenience and comprehensive support. For more information, visit www.thermofisher.com.